This guest post was written by Rob Watson. Graham has allowed me to hijack his blog to throw in my perspective of retail on the Internet. I work for a company called Supplyant which offers marketing and e-commerce services. I wanted to share a few recent insights from dealing with a client that runs a very successful eBay store. 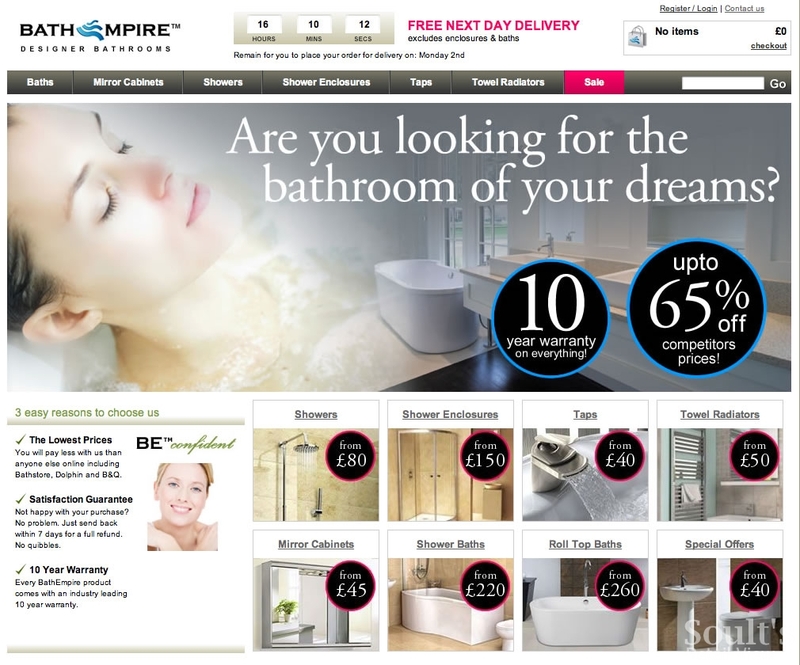 Our client sells bathrooms products. Showers, shower enclosures, taps, towel radiators, etc. It’s all excellent quality stuff and I’d love to offer you all a discount, but I’m afraid that’s not my call. Anyway, before I completely digress, the client approached us because he wanted to build a little space of his own on the Internet. To have his own brand, increase his reach and ultimately sell lots more showers! Now, before this article starts to turn into a horrible-to-read testament to how fantastic we are (feel free to come to our own website to read that! ), I’m going to get to the point. Despite their similarities, there are some huge differences between eBay and e-commerce. But I’ll get to that in a bit; first the similarities. eBay do an excellent job of marketing. They bring 100,000s of potential customers to their site everyday, so it’s only fair that you should be paying a fee for being there. Once you’ve been selling a while you can even reduce those costs as listing fees drop. The biggest cost though tends to be your pricing. eBay is rife for people trying to undercut you. You will find your margins being ripped to shreds to get a look in. Compare that to going alone though. Is that any cheaper? Hell no! Advertising costs through Pay Per Click (PPC) programs, like AdWords, can really ramp up. Plus there is a ton of other marketing channels to explore. SEO, shopping comparison sites, social media, email marketing. They all require money and resource. On the Internet your competition are never far away. But on eBay they are listed right next to you. With very little for the customer to go on, it’s not surprising the cheapest seller gets the business. Get a bad customer rating on eBay and your business can be ruined. The perks to having a high level of customer satisfaction are so huge that should you lose that, you can be sure you will feel it. This pain isn’t quite as immediate with your own e-commerce store, but you can be sure it will affect your ability to grow. Online shoppers are increasingly turning to sites like Review Centre before buying from a new site. When comparing two retailers, all it can take is a bad review for you to lose a customer. OK, now to the first major difference. eBay’s reach is huge. But it is finite. Unless you continue to sell more and more products how many more listings can you hope to gain? 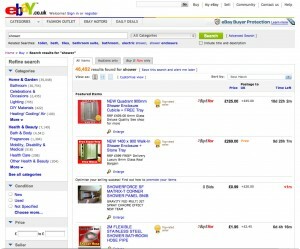 Our client is already highly visible in the bathroom category on eBay. He’s not afraid to increase his range to cover other bathroom furniture, but that involves greater costs. With good marketing, PR, social media, etc., the growth of bathempire.com could be huge. Our client is already planning on opening a showroom in Coventry early next year. Would that really be possible with just an eBay presence? We just recruited a new employee who worked for a company which sold packaging through eBay. They enjoyed the perks of a high customer satisfaction ranking, but then they suffered with an issue with their supply. Some customers were let down by the service, their ranking dropped below the level needed for Trusted Store status and the business folded shortly afterwards. The point is that when you are selling through eBay, it’s eBay that calls the shots. With your own website you are in control. Sure, unhappy customers will definitely cause you pain, but it certainly won’t put you out of business. So you are an eBay seller that offers great products, great prices and great service. You go out of your way to keep every customer happy. When that customer tells their friends about the great buying experience they just enjoyed, who do you think they credit? Who do they say they just brought from? eBay of course. All your hard work has been a massive boost to eBay’s brand. How much better would that feel if they were to tell their friends about your store? Where your business gets the kudos. That would feel good, right? Now, I’m not trying to knock eBay. It’s without doubt an incredible selling tool. But it has its limits and a great eBay business could easily become an amazing e-commerce business in it’s own right. It’s just time to start thinking bigger. Previous story The Original Factory Shop in Morpeth – a shift towards more upmarket locations? Ebay is a pretty cost effective in relation to the PPC except as you say your competition is clearly rtying undercut you at every turn. PPC gives you more scope for increasing your prices and although can be expensive, done correctly can become very rewarding. I have found that it is best to utilise Ebay alongside PPC balanced with natural listings!! I guess Terry, the main aim is to be whereever your customer is. PPC, Organic, ebay, amazon, shopping comparison websites, etc. It’s alot to manage, but if you get the right systems in place, you will win. Ive seen many many e-commerce retailers (particularly manufacturers selling direct) struggle with providing a great enough level of service and getting lots of negative feedbacks. 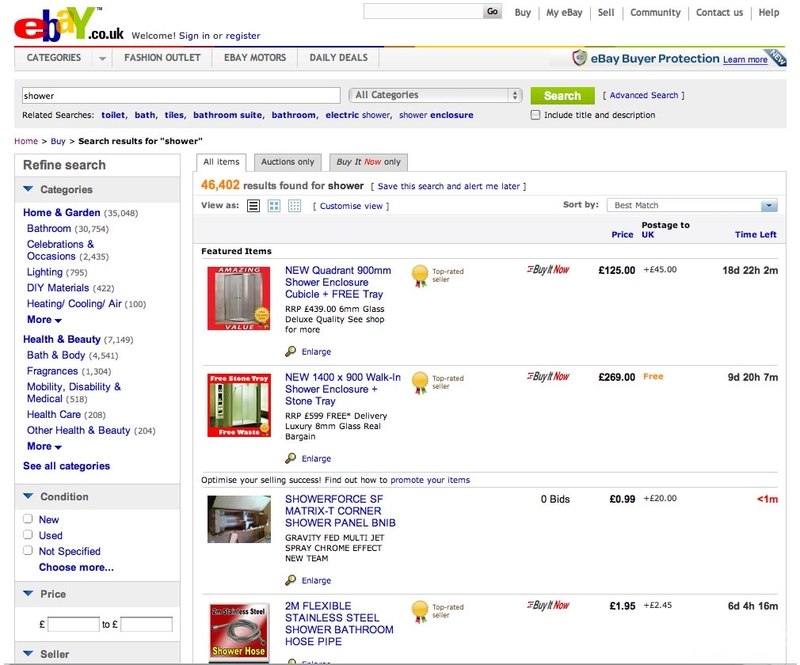 Id suggest to anybody before they enter the world of retailing online to give ebay a go. Its a great training ground in giving great service. Yeah, it’s a good point. If you can crack customer service on eBay, then you are in the perfect position to succeed with eCommerce. Soult's Retail View » As big-name retailers crowd the bathrooms market, how can the indies fight back?